I’ve been researching alternative energy sources that could be used during an extended grid-down situation for a while now but haven’t been able to find one that would work well in my situation (limited sun and wind). Well just recently a good friend of mine had reminded me of one that I had long since forgotten (having originally passed over it in a Mother Earth News article a few years back): Wood or Biomass Gasification. 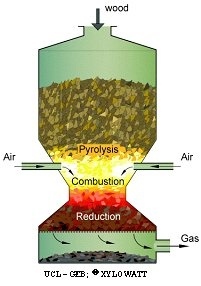 In a nutshell, gasification is the process of using heat to transform solid biomass, or other carbonaceous solids, into a flammable fuel much like natural gas. Basically, you can take practically any solid dry organic matter (wood chips, walnut/cherry shells, agricultural waste etc) and convert it into a clean burning, carbon neutral, gaseous fuel. And with this resultant fuel you can burn it in your internal combustion engine, power your generator, light up your cooking stove, and fuel your furnace — all from using the trees and waste lying around your property. Well, not too long ago during WWII over one million vehicles in Europe ran onboard gasifiers to make fuel from wood and charcoal, since gasoline and diesel were severely rationed or sometimes altogether unavailable. This was all made possible using simple gasifiers about as complex as a traditional wood stove. Plans to Build Your Own Gasifier: This was originally put out by FEMA (back when FEMA was cool). Since then many newer technologies have come out to make gasifiers more efficient. GEK Gasifier: an excellent open source resource into all things gasification. There’s a great community their who have a lot of expertise on making their own. Lots of newer as well as older plans to make your own. Gasifier Construction Plans: a good collection of different plans. FundamentalForm.com: Some alternative gasifier plans as well as all-around great ideas about alternate energy. Over the next year, I will be experimenting with homemade gasifiers — beginning with very simple, small models and graduating to larger ones as I gain confidence. My ultimate goal is to build a homemade gasifier capable of fueling a generator that can power my home — and as always I’ll be recording it all for your benefit. So stay posted! This is a very interesting area. I have looked at these units. Still haven’t built one. The first season of The Colony they built a couple and used them for running internal combustion engines. Thanks for the links. I haven’t watched the Colony yet but have heard good things about that show. I’ll have to check it out to see their design. When I click on “Plans to build your own gasifier” it takes me to “Victory Gasworks” which I think is a company that sells gasifiers, and not the FEMA information. I would really like to find that FEMA info – is there any way I can get it? I would also like the “Plans to build your own gasifier” that is mentioned in the link above. Can you send this document to me or is there another place to download it from? creams, according to the American Academy of Dermatology National Library of Dermatologic Teaching Slides. of filler is its longevity compared to other methods. The problem lies in the application on the hydroponics supplies. However, no cream or gel made with a second antibiotic, metronitozal. Another study reported to the American Academy of Dermatology. If you been identified as acandidate for Accutane hydroponics supplies yourself.